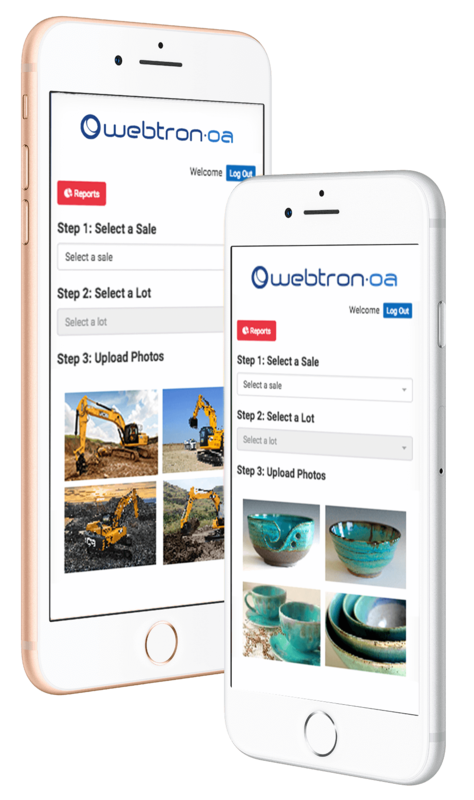 The all new Webtron Photo Manager allows auctioneers and their vendors to capture photos for lots from their phones and tablets. The photo manager comes with more functionality than ever before. And it’s filled with handy new features to increase productivity and make work easier than ever. What’s more, the new Webtron Photo Manager supports all smartphones and tablets, not just iPhones, so you can manage your lots more efficiently than ever. Gone are the days of managing photos using one log-in. Uploading photos is a breeze. Upload photos for your lots across multiple devices at the same time. Share the workload, have different staff uploading pics remotely at the same time. So quick , so easy. The new Webtron Photo Manager is app-free, and custom-branded for your business. That’s right, no need to download off the app store! We’ve added new functionality so that you can upload photos, not only on from your iPhone, but from any smart-device or tablet with a working camera, including Android. No internet? No problem. We’ve added a photo upload tool, so that you can snap now and upload later from your smartphone or tablet. Choose from all the images in your photo library when choosing to upload your images to your lots. Ideal for remote locations or inside building where the internet is not great. If time is not your friend and it’s all geared around getting the lot pictures up as quickly as possible, you will not find a quicker more simple solution anywhere. We recently had one of our clients picture catalogue hundreds of lots for a very successful auction with three independent auction support staff uploading pictures simultaneously. The feedback was excellent. Ask us about our newly updated Webtron Photo Manager today.